It was going to be a clock tower with a candy face and a light inside the top, but it softened and collapsed within a few hours of being assembled. Darn humidity. When I told my mom about this, she had a solution. She bought me a set of star-shaped cookie cutters for making a cookie tree. The cookie tree, she said, couldn't fall over because each cookie was stacked on the one below it. It was a Hawaii-proof gingerbread creation. So I tried it. I still wanted to have candy windows, so I cut them out of the points of each of the larger stars. The finished product looked like this. Not too bad. Over the next few years I tried different things. 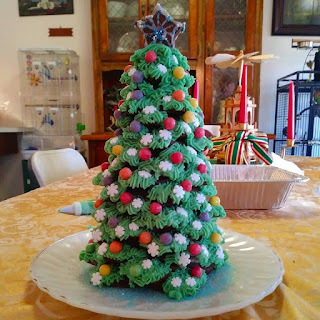 No more candy windows, but since a tree should be green I tried spreading each cookie with green frosting. Most of the green ended up hidden between the cookies. So the next year I tried dipping each cookie in green frosting. That doesn't quite look the way I had envisioned it. It's all drippy. This year I filled a decorating bag with green frosting and used a star tip. First I stacked up the cookies, using a ring of frosting between each one. Then I started at the bottom and piped the frosting onto the tips of each cookie star while my children put on the candies.